We haven't heard from Sammy Marshall lately, so I thought I'd remedy. 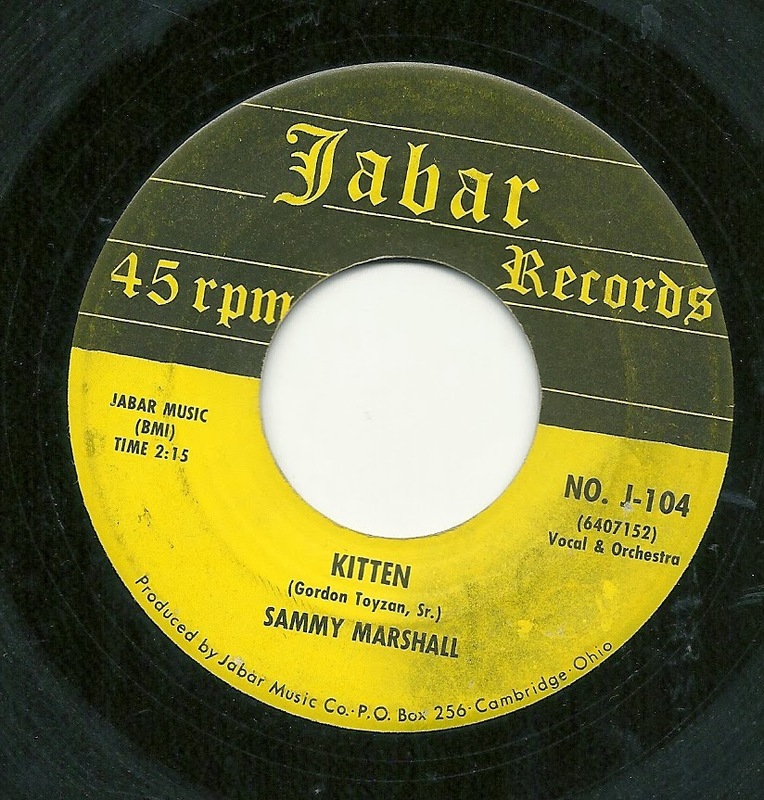 Here's a slight, but enjoyable teener from the Jabar label of Ohio, via the Globe song-poem factory, titled "Kitten". The drum intro and initial guitar part seem (to me) to suggest something of a soul arrangement, which would be an interesting setting for Sammy, but then the sax comes in, and the record settles into a fairly typical early Globe groove. The words are cute, though, and right in Sammy's wheelhouse. On the flip side, we again have Sammy Marshall, in another one of his typical settings, in this case, the country weeper. 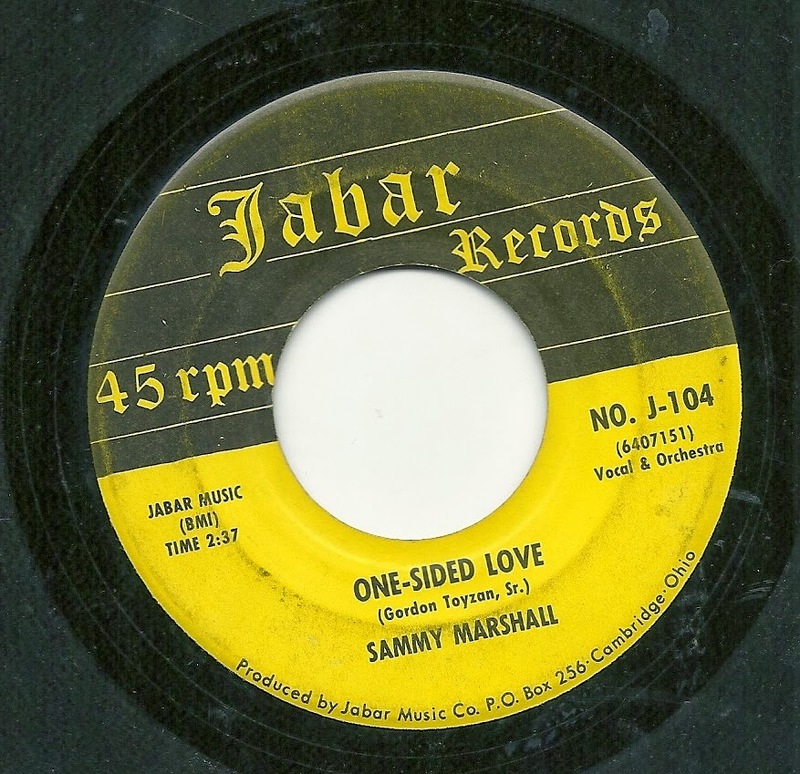 "One-Sided Love" doesn't do much, but I do get a kick of the fact that the bass player doesn't seem to have learned the chords, as he goes to sour notes at least four times over the course of the tracks, twice in the same spot each time the chorus comes around. 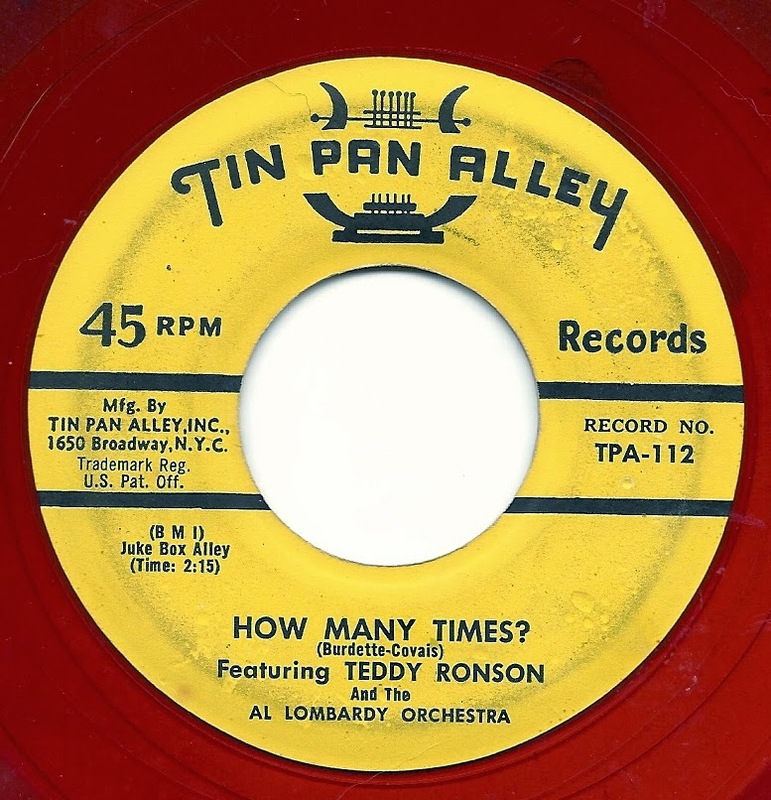 Today's record comes from the earliest days of Tin Pan Alley as a record label. Given that they gave double numbers to their early releases, it looks like this - # 111/112 - was likely their sixth release, probably from 1954 or 1955. Like many early TPA records, there's a sheen of professionalism lurking about the edges of "How Many Times? 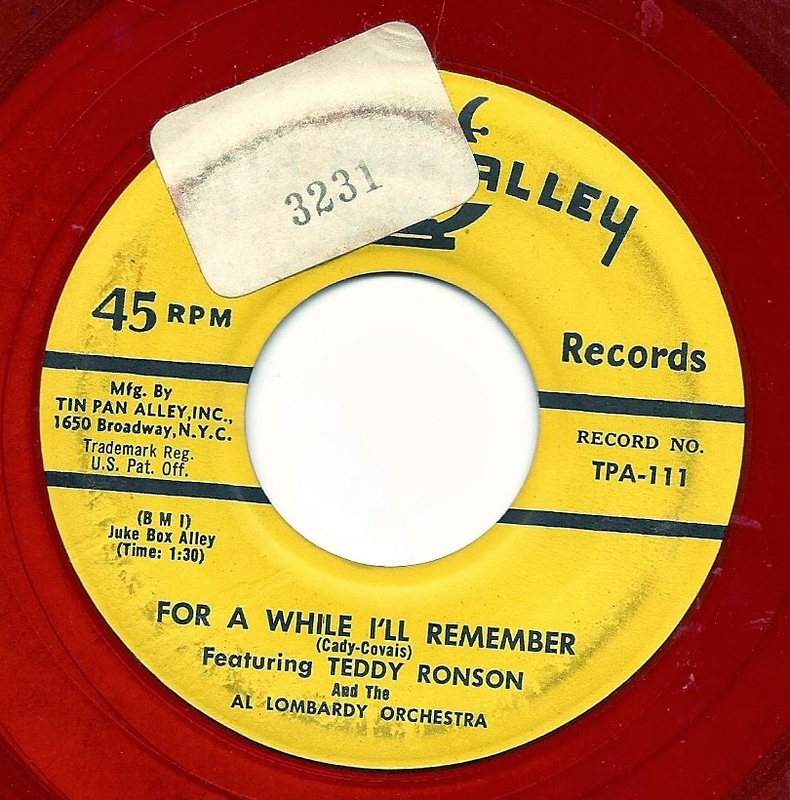 ", by the team of Teddy Ronson and the Al Lombardy Orchestra (all of whom disappeared from the label by 1956). 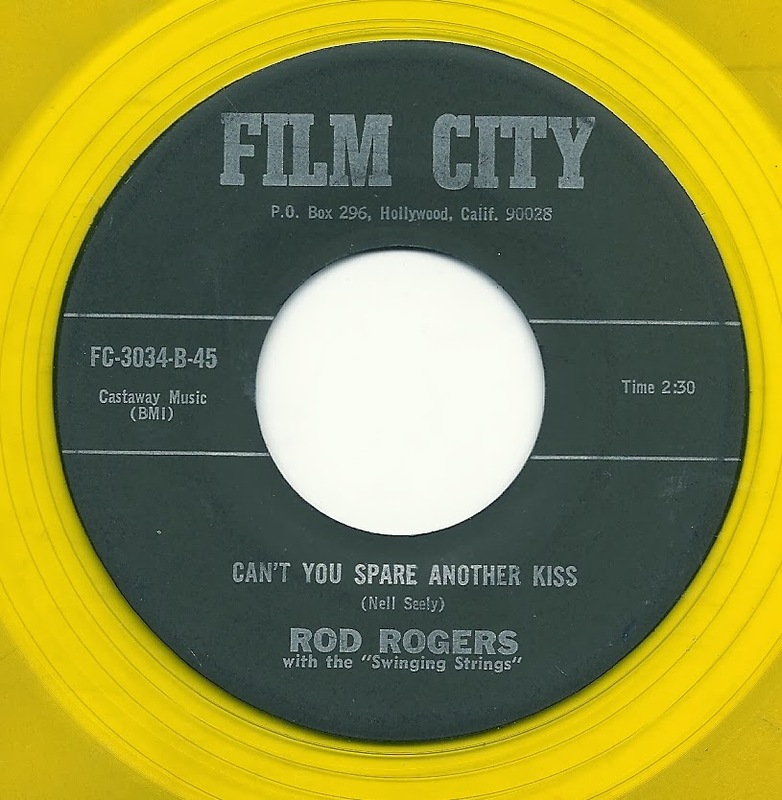 The song could just as well have been a stab at a legitimate hit (however unlikely that might have been, given the quality of the vocal, but then, a ton of horrid vocalists were having hits in 1954). 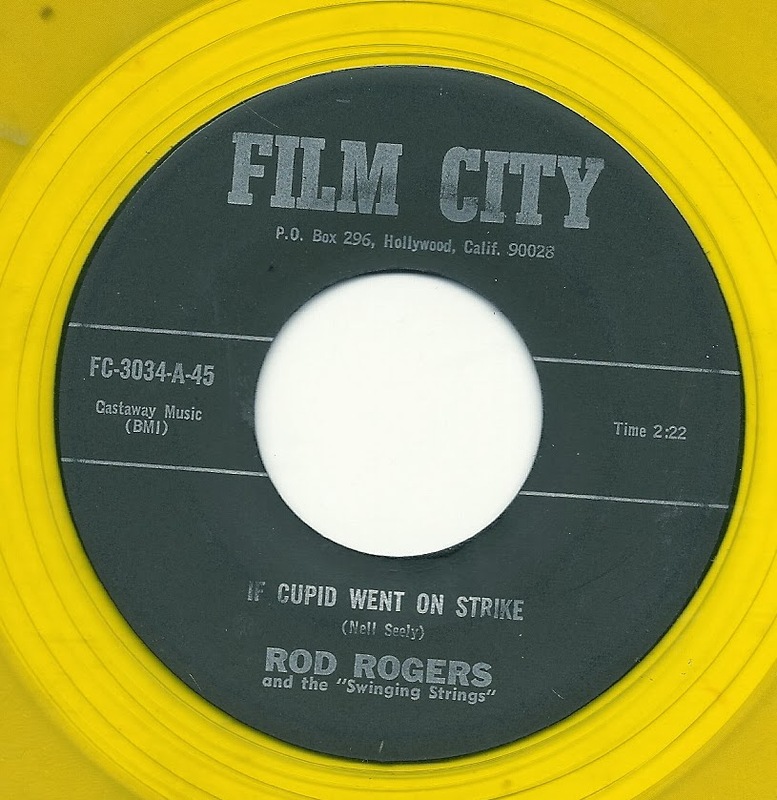 The two most remarkable things about the flip side, "For a While I'll Remember" are its surprisingly short length (just 88 seconds), and the fact that when they made the record, they allowed the tape to ramp up to speed on the first note, leading the dramatic opening piano note to lurch up into the correct key. I can just hear someone say, "Ah, they won't notice - leave it that way" - that is, if they even bothered to listen to the pressing. The recent travelogue we've been on will be put on hold for at least the next two weeks, while I offer up my annual tribute to St. Valentine's Day. And what lucky young person wouldn't feel lightheaded and start to faint at the thought of being serenaded by Sterling's own smooth singing Norm Burns? 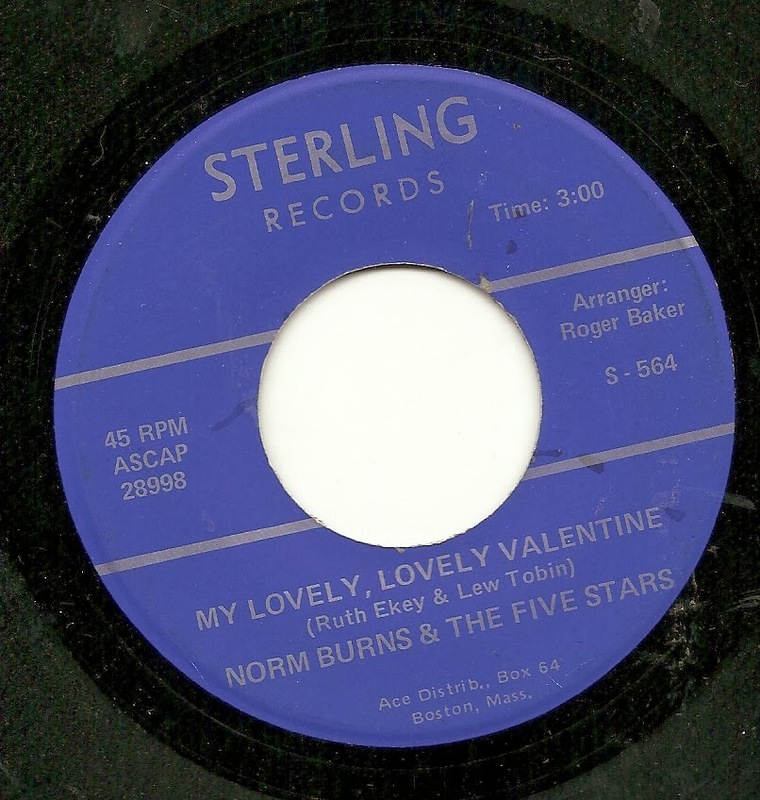 Here's Norm, with a tender waltz sung to his one-and-only, "My Lovely, Lovely Valentine". It seems very likely that Ruth Ekey wrote this song as a tribute to her husband (or husband-to-be), and I do wonder when I see such a name on a lyric, what the song-poet thought when she heard a male voice singing her song. Ah, well, hopefully Ruth and her beloved were captivated by Norm's dulcet tones. As is sometimes the case when I offer up a seasonally appropriate song as the feature, the real winner is on the flip. 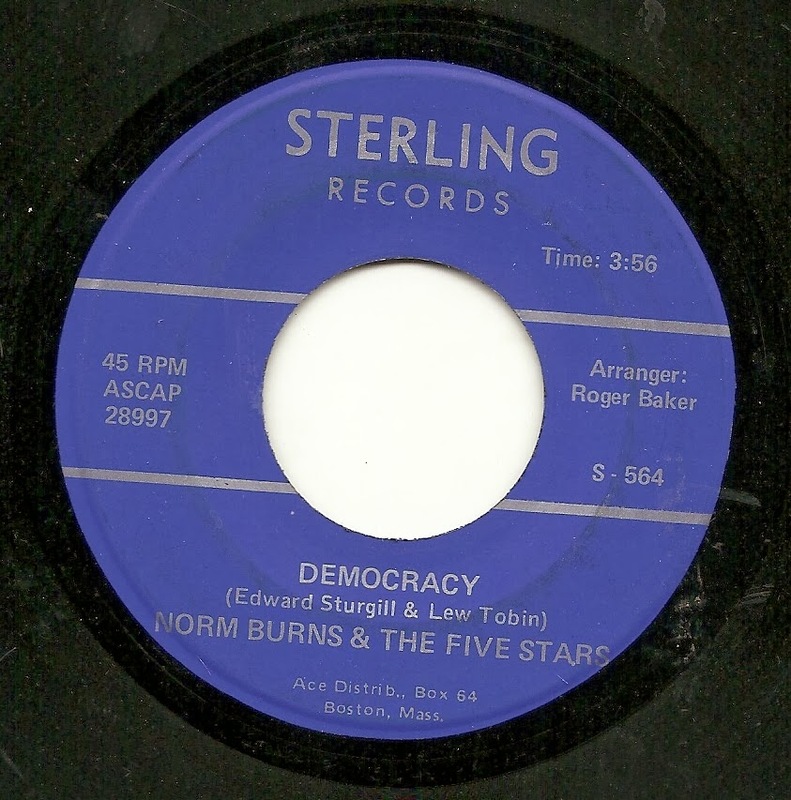 In this case, I suspect that almost anyone reading and listening today will agree that "Democracy" is the more memorable of the two tunes on this 45. I'm not saying "better", because I'm not that's the right adjective. "Weirder" certainly applies, as do several other words, including "unusually lengthy for a song-poem" - it's four minutes long! Rather than give a greatest-hits review of this unique set of lyrics and performance, I think I'll just let you enjoy it, enjoy it, enjoy it yourself. The more I hear this one, the more I think it might have been compilation worthy. For my money, the best singer ever recorded, and that I've ever heard anywhere. No one comes close. His voice was the purest expression of joy, or sadness, or anger, or righteous indignation, or whatever else was called for. In addition, his singing was a natural extension of his speaking voice, unadorned by any embellishment, misguided training or showboating, and that's exactly the sort of singing we don't have enough of today. His voice is pure emotion, expressed directly. His voice is the sound of America. His voice is the sound of life being lived well. And not only that, Pete was without question in my mind, the most important American musician of the 20th century. I'm not saying that based solely on his songwriting or performances - I wouldn't try to support that statement. What I mean is: looking at any prominent musician of the century, and the totality of what each of them did, in all areas, musical or otherwise, again, no one comes close. He was one of the most important Americans of the century, period. 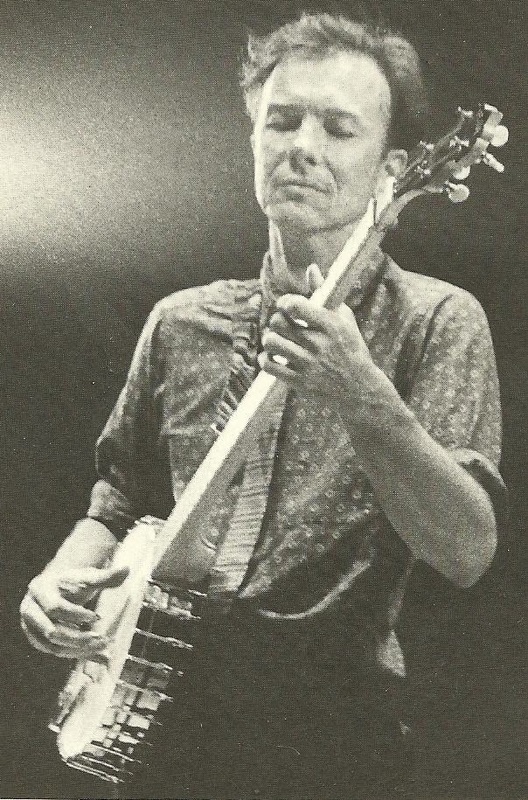 My main intent here is to share some of my favorite Pete Seeger tracks, and I'm going to start that right here, with a sidebar a few songs down. For the most part, I'm not going to focus on the most famous songs Pete is associated with - those can be found in myriad places - but instead will feature the lesser-known songs that he recorded that resonate the most with me, with a few exceptions in chronological order. I suspect I own close to, if not more than 95% of the recordings that Pete released, either in their original formats or re-releases. These are my favorites. Before starting that chronological ride, I want to start with the recording I consider not only Pete Seeger's finest moment, but one of the two or three greatest single tracks ever recorded. This is one of those perfect records that I could listen to multiple times a day without getting tired of it. It's found on an album recorded at the Weavers' reunion concerts at Carnegie Hall in 1963, but aside from some key instrumental backing from other members of the group (the double bass in particular is essential here), this is all Pete's show, or rather, Pete Seeger with an choir-by-audience numbering in the thousands. Listen to how simply Pete suggests they sing with him, going into the second chorus, and how, by the end of the song, it's a towering massed vocal singing with him. It helps that Tom Paxton's "Ramblin' Boy" is an incomparable song, but the magic here is what Pete does with it, with his singularly wonderful voice and with the audience. Now it's time to step back a further 17 years or so from 1963. Next up is a song recorded for a tiny label in the mid-1940's, at around age 25, along with several of his lefty compatriots. "Listen, Mr. Bilbo" is, most directly, an indictment of a truly awful human being, Theodore Bilbo, who was concurrently a member of the U.S. Senate and of the Ku Klux Klan. But if you overlook the specific reference in the title, and adjust the lyrics to include what some today's consider to be "scary foreigners", this song could just as well be used as an indictment of xenophobia in general, and of any number of today's politicians. The energy and emotion on this record are just unbeatable. The history of the Weavers, which Pete formed with three like-minded musicians, is well known to many, and easy to find for those who aren't aware of them. Suffice it to say that they became hugely popular in 1950, but by 1953 had broken up after becoming pariahs thanks to the witch-hunts of the McCarthy era. At the end of 1955, they regrouped and appeared in concert at Carnegie Hall. From that concert come the three incomparable performances below. Then, one of the most gorgeous melodies I've ever heard, that of an Indonesian lullaby, "Suliram", made even more lovely by the Weavers trademark and unique harmonic blend. When Pete takes the lead vocal part way through, his voice is tender, sweet and intoxicatingly beautiful. If you have a chance, look up the translation to these words into English - they make me tear up every time. And perhaps the most popular melody that Pete ever brought to the US, that of "Wimoweh", heard here in a fairly accurate (vocally, anyway) recreation of the original 1939 South African 78. The vocal blend in the section from 1:04 to 1:19 is just stop-me-in-my-tracks gorgeous. Many of the remaining live tracks, below, display the thing about about seeing Pete Seeger in concert that many fans loved the most - his ability to get a crowd of people singing together, often in three part harmony, and his near insistence that those in attendance give it a try. At best, this resulted in soul-affirming moments of beauty, and even breathtakingly gorgeous choral sounds. The track I posted at the top, "Ramblin' Boy" is a wonderful example of Pete's voice with a audience full of singers, but there are many other great recordings of this type, as well. It is worth noting - no, it is required to note here - that, while almost all of what I've shared so far was being recorded - indeed, while Pete made at least five albums with the Weavers, and perhaps three dozen albums for Folkways, including hundreds of tracks, he was, the entire time, facing the wrath of the U.S. Government, including what seemed likely to be a likely prison term, essentially for refusing to reveal his private thoughts. Indeed, the most significant moment of his life I can revisit is what happened when he appeared before the House Un-American Activities Committee, to answer charges that he was a communist, among other things. 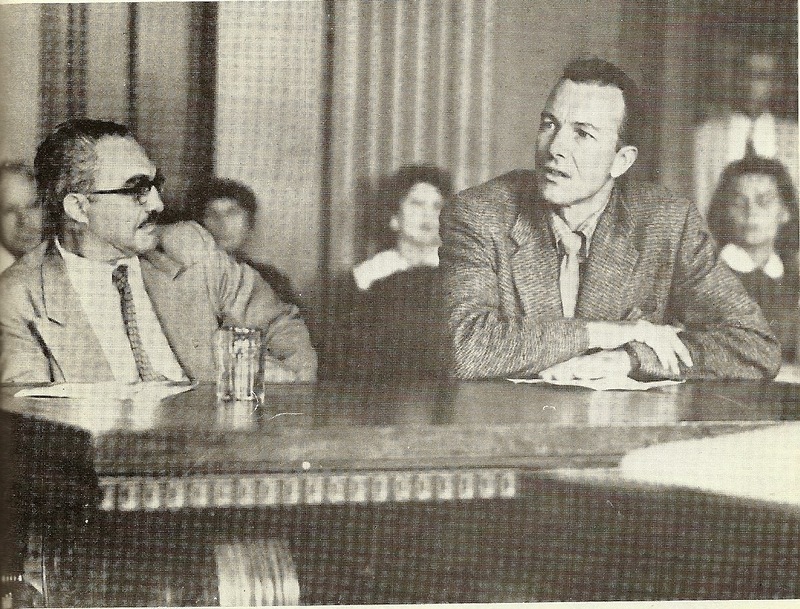 Many others had cowardly turned over names of friends and former friends to the committee, while even more had reasonably taken the fifth, which had imperiled if not ended their careers. Pete took a riskier, and flat out ballsier step, one I don't believe anyone else took - he essentially pleaded the First Amendment, telling the panel that, as an American, he had the right to believe whatever he wanted to, and in addition, was entitled to be free from the need to be compelled to reveal those thoughts in such a situation as he was then in. Basically, he told the committee that, under the constitution, his beliefs were none of their business. In 1950's America, those were daring things to say. Read his entire testimony here - it is bracing. And for this, facing the charges brought, he could have faced a decade in prison - he was actually found guilty and sentenced, although the ten counts of one year each were to be served concurrently - and was under the threat of this sentence for nearly half a decade. It's a good thing he didn't have to serve this term in prison, but a shame that the case was thrown out on a technicality, as it might have been (had it been decided correctly) a nice precedent to prevent or halt similar Congressional abuses in the future. But all of that was going on while Pete toured the country, spreading the word that through music can come peace and brotherhood, and, not coincidentally, being the key figure in the flowering of the folk revival of that era in the process. Around the same time as that recording, a performance at the Newport Folk Festival was captured, and this song from the concert was released. To me, it is among the prime examples of Pete's ability to lead a crowd in group harmony - as he first encourages them to sing, then goes over each part, then, realizing it should be in a higher key, moves his capo before launching into an inspired rendition of "Oh, Mary, Don't You Weep". The spoken opening is a great demonstration of how Pete's singing voice was just an extension of his way of speaking, and the moments here in which he sings a single high note over the harmonizing audience... well, that's something he often did, and it was always an amazing sound, rarely better than it is here. As the battles of the '60's were fading into history, and the Vietnam War was winding down, Pete released his final album for Columbia. This track was little noticed at the time (indeed, as was the entire album), and it's very telling to realize how much stronger the reaction might have been if Pete had released his bouncy little tribute to the wisdom of Ho Chi Minh in 1968, rather than in 1973. As it is, "Uncle Ho" still contains a lesson which the US (as well as other governments) still refuses to learn, "If a Man Will Stand for His Own Land, He's Got the Strength of Ten". In 1980, Pete released a full concert on a three record set, a concert and album package meant to demonstrate the art of leading the singalong. This is Pete's greatest album by a wide margin, and it reaches its zenith on the following song, where Pete turns an auditorium full of strangers into a full throated choir, singing in many-part harmony, until Pete is simply accompanying them on his guitar. The last few moments of "Run Come See the Sun" are perhaps the most sublime in Pete's entire catalog, despite barely even featuring his wonderful voice. If the sound of this track doesn't move you, then I'm not sure you and I have the same definition of "music". And finally, moving back to 1974, here's my second favorite Seeger track, a performance with his great friend Fred Hellerman on the folk standard "Banks of Marble". The track here, with banjo, guitar and piano, goes into a rolling rhythm, as their voices harmonize as in the old days, and they sing a song which is, sadly, yet to lose its meaning - it is as relevant today as when it was written, about 65 years ago. To quote a well known Seeger song: "when will we ever learn?". Well, not quite finally. I'd like to pay my own vocal tribute to Pete. Of all the songs I learned from Pete, this is the one I have sung the most often. It's not one of his own songs - it's called "Way Out There", and it was written by Bob Nolan of the Sons of the Pioneers, and I learned it from an album Pete did with Arlo Guthrie. This spur of the moment performance is from 1990, and features my great pal Stu and me. After some initial silly comments heard at the start, we get right into the song, and aside from a few lyrical flubs, I think it's a rather nice performance. 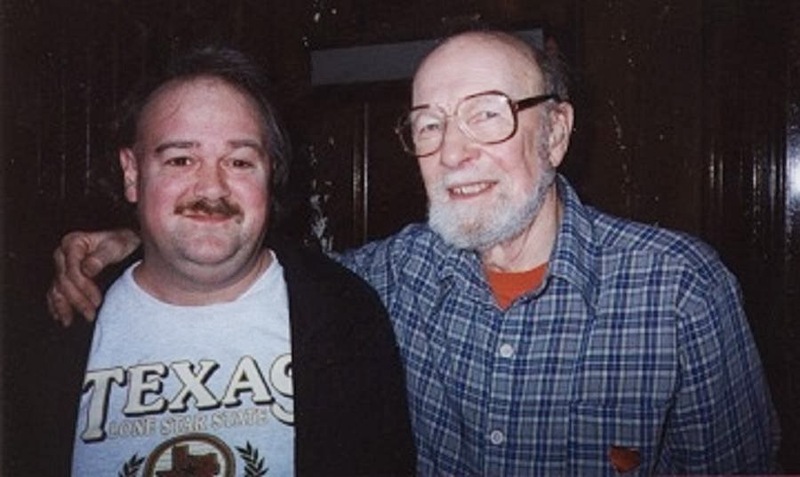 And here's my prized possession - a photographic memento of one of the two times I got to have a conversation with Pete, in this case in the late 1990's, following a folk festival fundraiser which had gone on about four hours (hence the glazed look in my eyes...). Thanks, Pete, for the myriad ways that you colored our lives, made it a more beautiful, musical world, help open our eyes to so many things, and worked to make America and the world a better place. 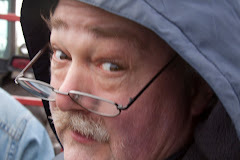 And in a more personal note, I simply can't imagine how my life would have been different, although I know it would have been for the much worse, had I not come to find you, your music, and your life story. Thanks.